1. I finally managed to get through all the girls' clothing and put away any shorts and make sure they had enough pants, long-sleeved shirts, sweaters and jackets. 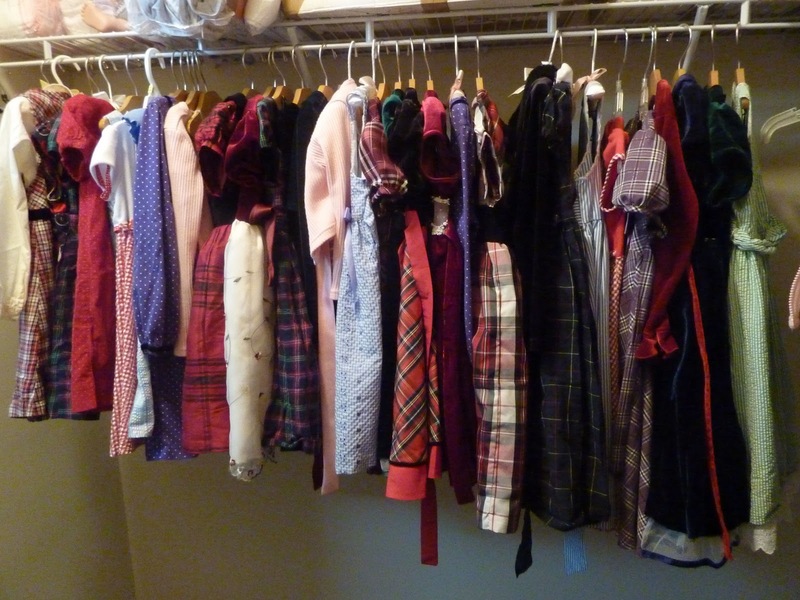 I also put away all their Spring and Summer dresses and got out all the Fall and Winter dresses. Dresses are a bit of a nightmare for me to sort by size since some 5T dresses are shorter than some 3T dresses but not all and so who should wear which dress can never be assumed by size. So I organized them by length. 2. I looked up the other day to see this. 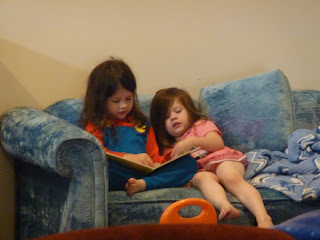 Cecilia reading a book to Felicity. Made me so happy. 3. Last year we got in the habit of saying the Chaplet of Divine Mercy every weekday afternoon at 3. Cecilia especially took to it but, like everything else, it faded by Spring when Teresa was born. We began saying it again last week. After the first one Cecilia made me promise we would do it again the next day. In fact she begins asking right after lunch when it will be 3:00. God bless her. She will certainly help keep me better about saying it every day. Her favorite part is the final prayer said three times. I've heard both Cecilia and Felicity singing it throughout the day. Now if I could just get Elizabeth to stop twirling her rosary beads. 4. My dad recommended a film I'd never heard of before. People Will Talk stars Cary Grant as Dr. Noah Praetorius who is an OB/GYN who believes in not just treating ailments but in helping the whole person. So, in his clinic, patients aren't woken for a bath at the convenience of the nurses but the nurses must wait until the patient wakes from a restful sleep. He cheers them up and tries to help them even beyond prescriptions. Jeanne Crain (who I knew from Rogers' and Hammerstein's State Fair and others might know from Cheaper By the Dozen and Belles on Their Toes) plays Deborah Higgins, a single woman who finds out she is pregnant and the baby's father was recently killed. She, in a round-about-way, asks Dr. Praetorius if he would help her out of her predicament with an abortion. He refuses though and talks to her about why she is afraid and offers to speak to her father for her. She refuses his help and tries to kill herself. He saves her and tells her she isn't pregnant to keep her from hurting herself again. Dr. Praetorius takes a drive out to her home after the incident and meets her father and falls in love with her. I'll let you watch the film and see the rest but it is really well worth a viewing. It is pro-life but it is more than that too. It is about being compassionate for each other, helping each other and doing more than we need to for each other. It is also about not judging people for their mistakes but helping them to move past them. It is a gem of a film and I'm so disappointed I'd never even heard of it before. Rent it. Netflix it. You won't regret it. It is a 1951 film that was way ahead of its time. 5. I like to burn candles in two places: the kitchen and our bedroom. Every time we go to buy candles, I let each of the girls buy a small one of the scent of their choice. Felicity changes it up every time. I never know what she will get. Previously it was some spa scent. This time it was Macintosh (apples). Elizabeth even got one this time. She definitely went by the picture on the label. She picked Maple Pancakes. Cecilia picks the same scent every single time. Strawberries. 6. I remember getting something called a computer in the late 80s/early 90s. I think it did something. 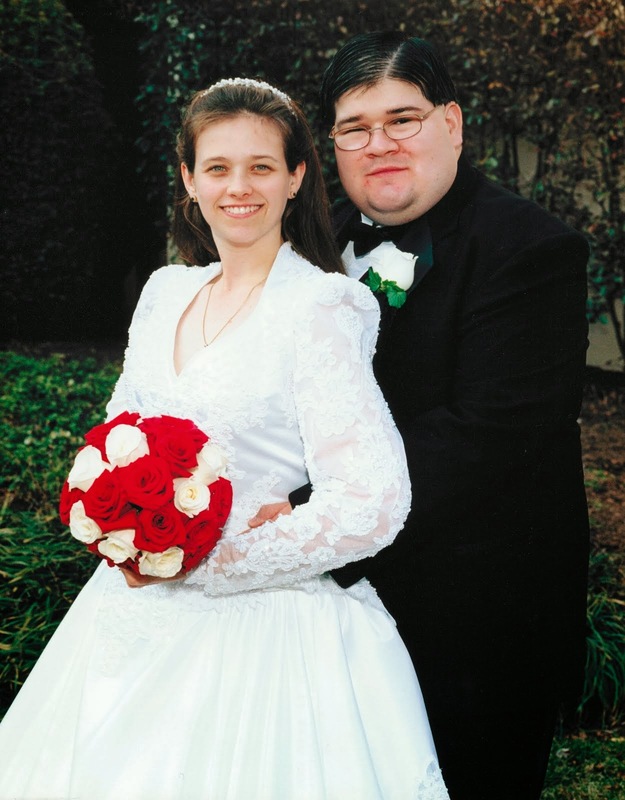 In 1993 we got an IBM and by 1994 I had convinced my parents to get the internet. When I went to college in '97, I got a Dell. A decent computer at the time but I remember wondering where the rest of my desk was as it seemed to disappear beneath the mammoth computer. In the early 2000s, I switched to a Dell laptop so I could use a desk again. But dealing with Dell customer services, or lack thereof, and trying to communicate with people who barely spoke English, made the idea of owning a computer I could take to a store when I had a problem (and no, I don't mean Best Buy - if I just wanted everything erased, my husband can do that) very appealing by 2005. So, in 2006, I converted. I bought an iMac. A year later I couldn't even remember how to operate windows. Apple and I haven't had a perfect relationship: twice their computers had serious problems and I had to take them in. How serious? The Apple geniuses couldn't fix it. But Apple never hesitated to honor its guarantees and, each time, gave me a brand new computer. I've paid for 1 Apple computer and am on my 3rd. My husband bought me an iPod when they came out, engraved. A few days before Elizabeth was born, my husband bought me an iPod Touch, which made my time in the hospital after she was born a lot more fun. On Elizabeth's first birthday, my husband stood in line for 8 hours and bought me an iPhone, which I now use daily and never go anywhere without it. So, although I came into the Apple family relatively late, Apple has certainly become an integral part of our daily lives. 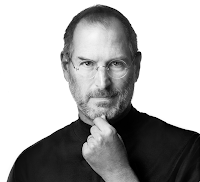 It was with great sadness that I read about the passing of Steve Jobs this week. The fact is, though I've never met the man, though I don't own any Apple stock, though I've only owned anything Apple for 5 years, Steve Jobs' genius has changed our lives. On July 25th of 2010, when I got a positive pregnancy test that would become our precious baby Teresa and my husband was at a conference in Italy, it was through my iPhone that I took a picture of it and texted it to him. I don't know if he was a good man, but the ways he has blessed our lives I cannot forget. Eternal rest grant unto him, O Lord, and let Your Perpetual Light shine upon him. 7. I will leave with this shot of my three oldest. 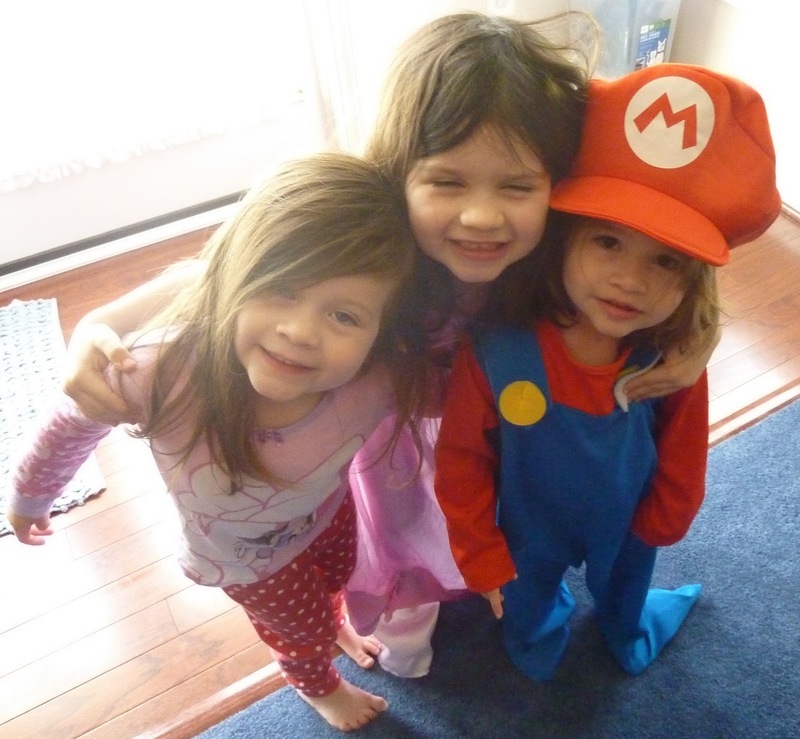 Yes, Elizabeth is wearing a Mario Brothers costume. Have a blessed weekend! More Quick Takes at Jen's! 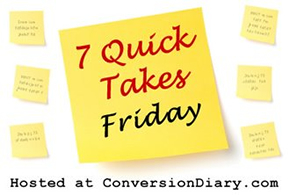 Great quick takes: #4 ~ a favorite movie of mine, love Yankee candles and am also Mac person. Your girls are so cute! 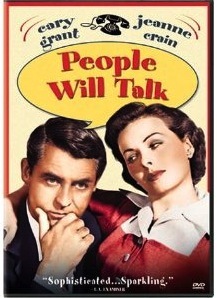 You sold me on the movie "People Will Talk." I just added it to my Netflix Instant Que.